It started as a joke, but ended up being seriously awesome. Kelly wanted to build a few snare drums designed to be both high quality and affordable. That meant that although we would use an all maple shell and machined aluminum lugs, we would also have to keep the production streamlined and simple. So, our new build would be the same size with the same finish (6.5 x14 with Natural Satin) to keep the build speedy, along with making it a distinctive 6 lugger, which also trims cost and production time (Of note: Some builders absolutely swear by having as few lugs as possible on a drum). The first batch of these went unbranded…no badge, no name, and these unnamed drums went fast, inspiring us to make more. 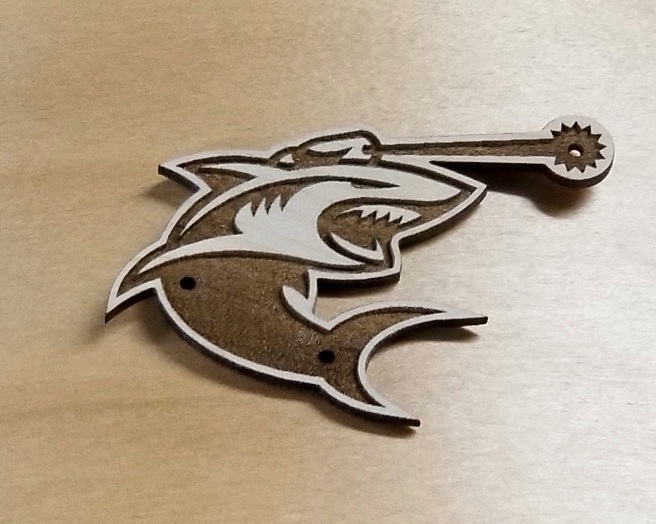 It was then that Kelly came up with the the idea of branding them the Laser Shark. Though not totally original, it brought a lot of laughs and a definite cool factor to this serious snare drum. It was agreed that we should make it official with a badge, laser engraved out of wood. We think the end design turned out perfect, and that fact that people are swallowing them up seems to validate our thinking. It’s a killer snare drum at a killer price. And a laser is actually used in its production. So there’s that too. Hit the practice room to hit the stage on Sunday, February 10 from 6 to 9pm. Join Dr. Arthur Hoffman on Saturday, February 2nd at 11am to learn stretches and other tips and techniques to prevent and treat the ailments that affect your health and playing. This is a FREE event at the shop. Join us at 2pm on Saturday, December 15th as 651Drums artist Dave King of The Bad Plus holds court for our Second Annual Coolest Clinic on Earth! This outdoor clinic lives up to its name as we expect air temperatures in the 20’s. No worries though as Dave will bring the heat on the set, and we’ll bring the heat with fire pits and hot coco and cider! This is a FREE event and will be the most fun you’ll ever have in the parking lot of drum shop. Also, expect day-of specials in the shop. See you there Twin Cities drummers! Just a couple of weeks ago Gordy shared with us a 2018 interview with him from the program Drum Heads and Tales than spans his experiences in the Steve Miller Band as well as explanation of the Open/Closed Technique he has pioneered. If you’re not familiar with this drumming technique, then check out the video for sure! Gordy Knudtson has been on the forefront of the Minnesota drumming, and music, scene for the better part of four decades. Between his time directing the percussion program at McNally Smith, giving private drum lessons, and doing studio and live work around Minneapolis and St. Paul, he has taught and influenced a Who’s Who list of Twin Cities drummers. On November 17th, Twin Cities Drum Collective has the unique opportunity to feature Gordy’s new (yet-to-be-named) Trio that also features mega-players Jim Anton, bass player in Jonny Lang and Greazy Meal among others, and the awarding winning guitarist Dean Magraw. After the musical performance and intermission, Gordy will conduct a drum clinic that spans many topics that include technique, drum ergonomics, and playing to the song. What’s been especially fun is hearing the excitement from drummers who know Gordy…if you have met him or seen him play, then chances are that you have great memories of him! This performance and clinic is not to be missed. RSVP on Facebook and then Get Your Tickets! Use PROMO Code Friends_of_TCDC for a 20% discount at checkout! Over the course of the day we had over a hundred drummers come through, and there were times when all the sets were rockin’. Pretty cool. So many people commented that not only about how great the drums sounded, but also about how each brand had its own distinct tone. The Modern Vintage line captures that vintage sound (complete with classic Gretsch bearing edges), our 651Drums feature sharp attack and full sustain (with dual 45 edges), and TCDrumCo perfectly balances warmth, attack, and sustain (with roundover into 45 edges). Of course we had a great many finishes on display too, from customs paints and fades, to a satin flame wrapped kit, to beautiful natural satins, including one with inlays. The feedback was gratifying! Of course, the clinics were real highlights. Jeremy Harvey from Cloud Cult played along to tracks and dazzled with his musicality on a 651 drum set. Jesse from Malamanya demystified Latin grooves on the congas and timbales, and Pete Buxman gave a great rudimental lesson on accent grids. Last, drumset Karaoke turned out to be a blast! While many drummers were a bit shy to try it, those who did left with all smiles. We gotta do that again! The day ended with giveaways of Low Boy Beater swag, including a new beater, and one lucky drummer walked away with one of our Twin Cities Drum Collective store-branded 6-lug snare drums. TCDC thanks all the drummers who came out for the festivities! And special thanks to our sponsors Tackle Instruments (awesome stick and cymbal bags and accessories), Low Boy Beaters, and the great folks like Joe at the Uptown VFW and Craig at Fulton Brewery. Opening a brick and mortar drum shop and custom drum company is not for the weakhearted, and it is certainly a poorly conceived get rich quick scheme! As we have said here and there, running a drum store and building custom drums are labors of love. This blog shares some of the challenges independent drum shops and music stores in general face, which makes their eventual success all the sweeter. To begin, much of the world has passed by small drum shops. You are reading this blog on a device on that much of what you want is a search and a click away. It’s convenient, comes straight to you, and if you buy from a big-box store or major distributor, you can often get a rock bottom price since they frequently get volume-based deals from major companies. I’d be lying if I said I never bought something online from Amazon, Sweetwater, or (gasp), Guitar Center. Online business is simply part of our world, which is why Twin Cities Drum Collective is slowly wading into it over time (hey, check out our Reverb listings)! Nonetheless, how we shop has unintended consequences. Minneapolis and St. Paul has seen great, even exceptional, drum shops come and go. Thompson Drum Shop (downtown Minneapolis), Torps Music Store (which had a nice drum department in St. Paul), Ellis Drum Shop (St. Paul and Richfield), The Drum Loft (NE Minneapolis), and probably a couple I’m missing have gone into extinction. While I’m sure there were a variety of reasons for why they closed, competition from the internet no doubt factored in, especially with the last couple of closures. While the internet can be an alluring place to shop, something is lost here. The touch and the feel that is so important to buying drums and cymbals is gone, as is the service, advice, assembly, or other help related to the product. I know a great number of drummers in the Twin Cities felt tremendous loss when these shops went the way of the dinosaur (though admittedly dinosaurs go extinct when they don’t adapt to customer needs). Another challenge is that Big Box stores have large buying budgets that can create an advantage at the price point and the quantity of products they carry. In fact, many major brands require a significant buy-in to carry them, ranging from a low of $2500 to $5000 or above. When you think about the number of drum and cymbal brands out there, this can become a challenge for smaller shops. At our drum shop, we have been lucky to get through the door with many major brands, although we choose not to stock many full drumsets by them on our floor. This is for two reasons. First, we like to save the floor space for our signature brands, 651Drums, TCDrumCO, and Modern Vintage Drums, and second, most everyone knows what a Drum Workshop or Ludwig drumset sounds like, so you should special order the one you want rather than buying one off the floor that has been worked over by many customers! 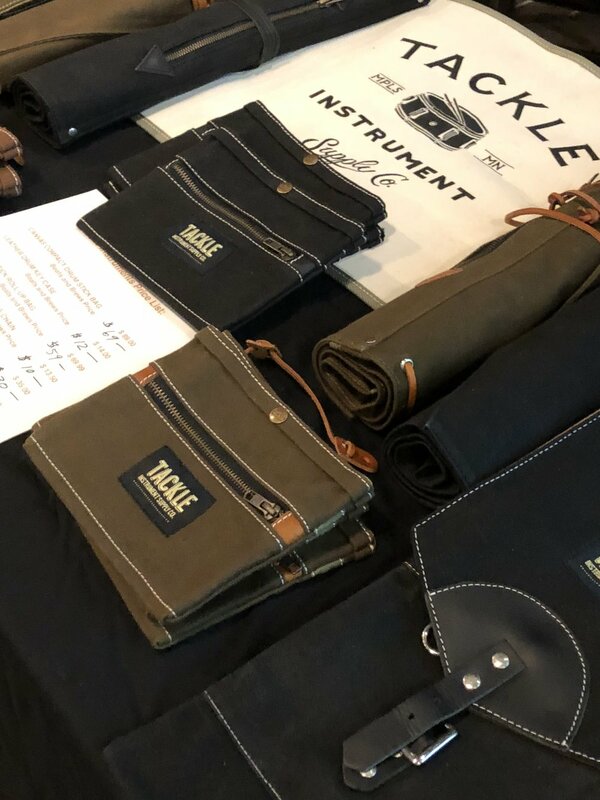 We have also been selective at Twin Cities Drum Collective, choosing a balance between iconic brands, our own custom brands, and sometimes passing on brands that might please generally but not profoundly. Another challenge is the Big Boxes’ advertising budgets that create a huge funnel that drummers are drawn through. This powerful tractor beam pulls many in, but do note you are being pulled to the Death Star! This is why the independent music stores like TCDC need customers to spread the word. We don’t have a tractor beam, but we are building a rebellion! Of course, this requires drummers to follow, like, share, and talk about our content and very existence! Simply put, the challenges noted in this blog are merely realities that independent drum shops face, so it comes down to this: we need to work harder, build a grassroots following, and develop customer loyalty because we offer something more or better. The something more and better philosophy is what has lead us to develop our custom drum lines for drummers who are more discerning, while also catering to those drummers looking for a more personal feel, a better buying experience, and for for exceptional service. As an example, a couple of months ago a young man came in with a TAMA snare drum with a seemingly broken throw-off. It didn’t stick, it was full-on stuck. Time to order a new one, right? It had been a slow day, and we certainly could have used the business. But not so fast. Instead, we took the snare downstairs to the shop and applied some TLC with an advanced version of WD-40, restoring the the throw-off to perfect function. Problem solved. No charge. That’s what an independent drum shop does, an act that probably won’t happen at a Big Box store and can’t happen on the Internet. As another example, a tour manager called us after hours looking for a particular cymbal in a specific size. 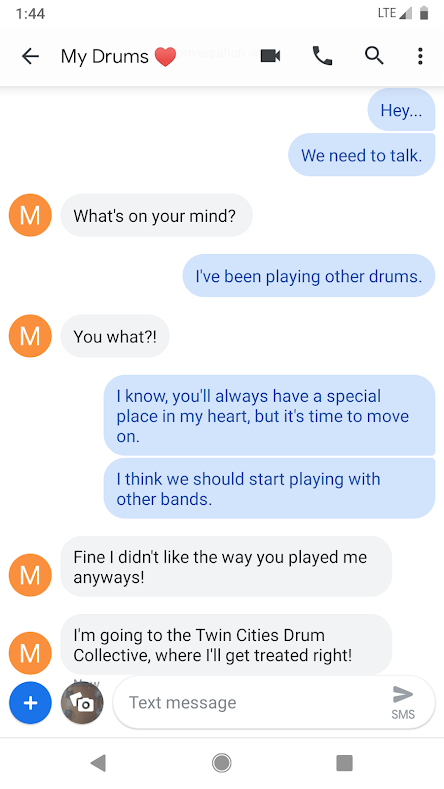 We didn’t have it, but searched on his behalf and found it at a Big Box so his drummer could be happy. We are here to help, even if in the short term our help is in the service of the big guys. And of course, the best examples are the customers who are learning about our custom drums made right here in South St. Paul, Minnesota. There is little more satisfying than working with a customer from beginning to end to deliver their dream drums. That’s what we do best. At Twin Cities Drum Collective, we know that we aren’t entitled to your business or loyalty, but we hope to have the opportunity to earn it. We also hope you’ll spread the word, being part of our grassroots movement to create a lasting legacy in the Twin Cities of Minneapolis and St. Paul, MN and beyond! The Great Snare Drum Throw Off Throw Down! Custom drum builders obviously love to put the best available hardware on their drums, and when it comes to snare drums, there is an obvious focus on the throw off (I’m old fashioned and sometimes still call it a snare strainer). This blog will talk about the great throw off debate that has happened in our Minnesota drum shop, and of course has happened in custom drum companies across the country. For the sake of this blog, we will focus on throw offs primarily used by small to mid-sized custom drum builders who have not designed their own. Obviously most major drum companies like Drum Workshop and Ludwig have their game down in this department, although some major companies are lacking (Gretsch, I’m talking to you!). Nonetheless, most custom drum builders are not sourcing from the major drum companies, so we’ll leave them out. First, let’s talk about the best of the best out there. To many drum builders, the Trick multi-step throw off is the cream of the crop. The Trick throw off is machined from aluminum, is available in several finishes, and has flawless operation. You will find that perhaps a majority of custom drum builder’s adorn their snares with the Trick. So what’s the downside? Well, the first is cost. A item this thoughtfully designed and machined comes with a price that will add about $60 to the cost of the drum, if the builder simply puts it on at his or her cost (selling at cost is a terrible way to stay in business)! In fairness, the expense is 100% justifiable to some (see below), and I have to say that it’s a pet peeve when people want something exceptional at a low, low cost. The other downside is its bulk that can make getting your snare drum into the case or bag a bit of a hassle. The key word here is a “bit”. If you love the Trick, it really won’t matter much to you. Last, a person could make the case that the Trick is over-engineered, a critique that might reflect a bit of envy. Another frontrunner in the throw off department is the Dunnet R4C. Like the Trick, this throw off has perfect operation, and it unlike others on the market, it swivels to accommodate both right and left handed drummers, and it has a quick release feature to change heads without losing your settings. Cool. I also think this throw-off is a clear winner in the looks department, with a design that would compliment most any snare drum style and finish. The downside with this throw off is the same with the Trick, the cost. However, the design and execution makes no compromises, so like the Trick, the cost might be warranted to some. On the up and coming list is the Inde throw-off, which operates similarly to the Ludwig P-85. Well-conceived with smooth operation an a reasonable cost, I see this one popping up more and more. In the looks department, it is attractive but not quite generic enough to work esthetically on all snare drums. To be fair though, it was designed to be on Inde drums, which look outstanding, and not necessarily to be put on everyone’s snare drum. As a replacement throw off, the Inde is a top contender with an adjustable mounting option to line up to existing holes. So what do we use at Twin Cities Drum Collective? What you want of course! That said, our stock choice is the Gibraltar Deluxe Classic, which has a Ludwig P-85 style of operation that is smooth and efficient. Further, it is relatively compact, and it looks great at a reasonable cost, literally taking thirty to fifty dollars of the price of the snare drum depending on the choice of throw off. Now it comes down to this…how often do you use your throw-off? In my punk band Dillinger Four, I have literally never turned off my snares in 25 years! I have had snares with the Trick throw-off, which was basically an exceptional yet dormant feature on my drum. If you rarely use the throw-off, save your money so long as your snare has a well-made one on it. However, if you use your throw-off often, and you have a preference, then let’s hook you up with what you want! That’s the very definition of custom…making personal choices about the details that matter to you. Know that at the Collective, we are looking out for both your preferences and your pocketbook! Welcome to the first Twin Cities Drum Collective Blog! In our regular blog we will be talking about custom drums, product reviews, drumming resources, the ups and downs of running a drum shop, and of course any and all topics related to custom drum building and drum repairs. Additionally, we hope to feature the occasional interview with leading drummers in the Minneapolis and Saint Paul area and beyond Minnesota. It’s only fitting in this first blog to discuss the (several) missions of TCDC, and how we are similar to, and different from, other drum shops and companies. 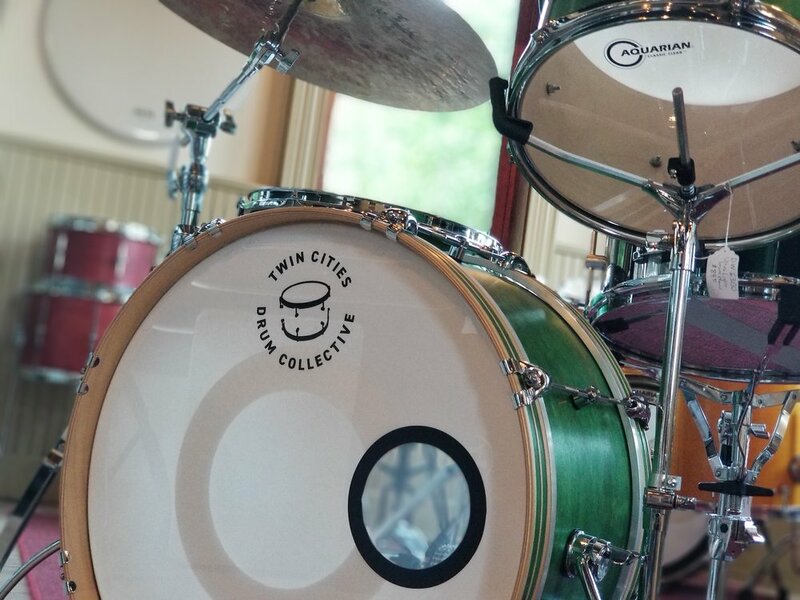 First, Twin Cities Drum Collective is similar to other drum shops in that we are a retail store that carries major brands of drums, cymbals, and accessories. Major drum companies we carry include Drum Workshop (DW), Gretsch, Ludwig, PDP among others, and we carry cymbals by the big three, Paiste, Sabian, and Zildjian while also stocking Bosphorus, Dream, and Meinl. In short, we can order most major brands of drums and cymbals. Say you want a set of Paiste 2002s, well just email or call us and we’ll get what you want in store! Same with hardware…we stock a nice selection of DW and Gibraltar, but if you want something special, we can likely get it for you. We then round out our inventory with Aquarian and Remo drumheads (and yes, we can order Evans!) and Los Cabos, Vater, and Vic Firth sticks. If you’re into a particular size or another brand like Promark or Regal Tip…let us know and we’ll get you covered! We also stock all the “back shelf” stuff you need from felts and washers, to snares, and hardware bits and pieces. Oh, and we should mention that we carry excellent case, bag, and accessories brands like SKB, Impact, and Tackle. So how is Twin Cities Drum Collective different? First, we offer full service repair and and reconditioning right here in our South Saint Paul shop. Cracked Vistalites? We fix 'em. Trouble tuning drums? We’ll cut you new bearing edges, and you’ll discover you do know how to tune drums. Tired, worn, or damaged wrap? Then let us rewrap your set. We are one of the few drum shops in the Minneapolis and St. Paul area set up to assist you with these services. In addition to drum service and repair, we have our custom drum lines which are the heart and soul of Twin Cities Drum Collective and that set us apart from the pack. When Kelly and I conceived of doing our own custom drum line it quickly became apparent that we had similar and different visions related to looks, branding, and building philosophies…like most drummers do! So instead of creating just one custom drum line, we quickly decided that we would not limit ourselves and would embark on creating three custom drum lines under the umbrella of the Collective. Kelly’s vision was Twin Cities Drum Company (TCDrumCO), and after over 10 years building custom drums, he already had a lug design and a particular bearing edge picked out. Machined from aluminum and given a brushed finish in the shop, Kelly’s lug is different from anything else on the market, a true differentiator as they say in the industry. The feedback has been affirming, drummers love the look of it! Kelly gives TCDrumCo a roundover into 45 degree bearing edge. This edge fits the contour of drumheads and gives a perfect balance of warmth, attack, and sustain. The TCDrumCO badge is laser-cut into maple, and again, has a distinctive look among custom drums. Lane’s vision was 651Drums, a brand defined by its intersection between form and function. The lugs on 651Drums are also machined from aluminum and are given a high polish right here in South St. Paul, Minnesota. This polish leaves the lugs looking like chrome without an added chemical process and with nothing to fail down the road. 651Drums feature the Dual 45 Bearing Edge, designed for a wide tuning range, bright attack, and long sustain. Then, the badge is acid etched into chrome. The end result is a drummer’s drum that spans musical styles from jazz to punk. Then there is Modern Vintage Drums (MV Drums). These drums start with Okoume/Poplar/Okoume shells. What is Okoume you ask? A sustainable wood with the same look and sound qualities of Mahogany. These drums are given the classic roundover bearing edge for that warm, vintage tone and finished off with beavertail lugs and the art deco inspired MV Drums Badge. For fans of the look and sound of vintage drums, Modern Vintage Drums are your thing. Check em’ out. Last but not least, we offer expertise and service that you will not find in other music stores and drum shops. This is we what we do, so if you need advise, lessons (we have great instructors), or simply want to support a Minnesota drum company run by people with a passion for drumsets, then we are your shop. Drop in anytime, and stay connected to our social media for information on our weekly patio grill-outs called “Beats and Brats” (held on Wednesdays until the snow flies and maybe beyond…we do live in Minnesota! ), or for our other events and gatherings held both at our South Saint Paul store and at select venues in Minneapolis. At TCDC, we like to say that everything we do is “by drummers, for drummers!” We'll see you around!